I have two super cute books to share with you today from the Pumpkinheads series! Peanut's Mistake and Imagine. 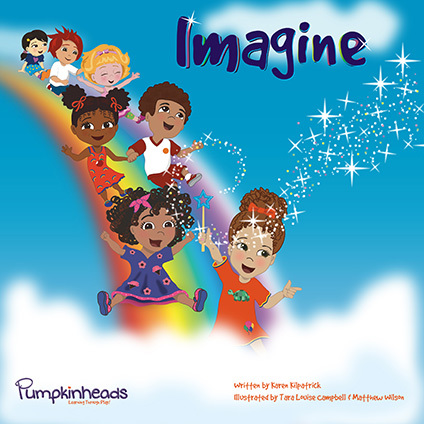 In Imagine the kids have fun using their imagination for all kinds of things while they play. It is a super cute book that really encourages kids to have fun using their mind! In Peanut's Mistake, the dog Peanut makes a mess and the kids have to clean the mess and they teach peanut he is still loved even when he makes a mistake. I loved how both of these books are lessons while still being enjoyable reads. Kids learn so much through books so having the lesson is important to me. Both of these books opened up discussions with my 5 year about using his imagination and how sometimes we make mistakes but it will be okay! Being silly and generating giggles is what Karen Kilpatrick loves to do in her books. Children will immediately be captivated by Imagine’s colorful and dynamic illustrations.The book offers a great jumping-off place for them to share some of their ideas, no matter how wild. Encourage your child to play the “imagine” game with you while with you—in the car, helping you in the kitchen, or anytime or anyplace. Will they choose to fly or swing from stars? Will lunch become tiger butter and tulip jelly? The book includes some suggestions to spark children’s imaginations along with a subtle yet important message about appreciating differences in outward appearances. 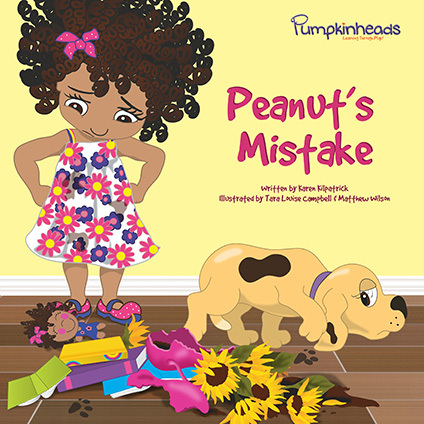 Peanut's Mistake - Children ages 3 – 6 know how easy it is to accidentally cause a mess—spilling milk, leaving a trail of cookie crumbs, seeing someone stumble over toys not put away. So they will relate to puppy Peanut’s mistake when he makes a mess while dashing through the house. Parents, grandparents, even babysitters might be tempted to shout or put the dog outside and reprimand the child. But in Peanut’s Mistake, Kilpatrick shows Carmin handling the situation in a suitable, not scary way. Rather than punishing the dog, the child and dog promptly clean up the mess and remember to follow the rule about no running in the house. Carmin focuses on teaching Peanut to learn from his mistakes, and encourages him to come to her for help in the future. Again, Kilpatrick offers additional suggestions on how to handle mistakes and more. Visit Pumpkinheads.com to learn more about either of these books or to purchase! My grandson will watch this DVD!